For one group of devotees, Kingdom Hearts III is far and away the most important game of the generation. 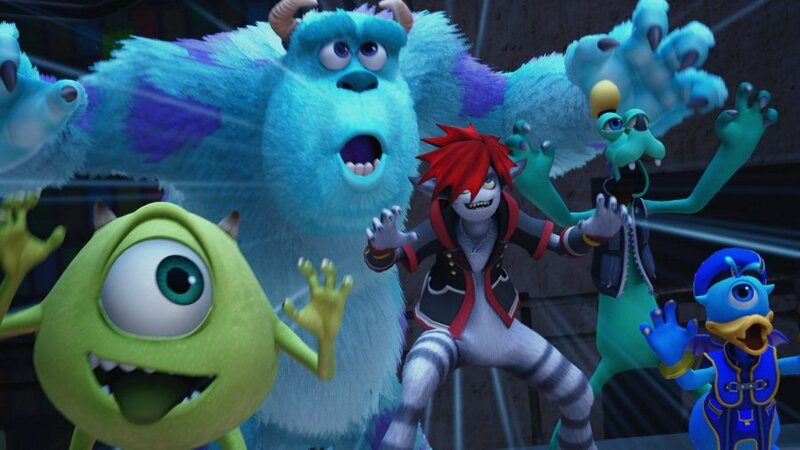 Announced all the way back at E3 2013, Square Enix’s latest Disney crossover attempts to conclude a story 17 years in the making, while also inviting newcomers along for the ride. The adventures of Sora, Donald Duck, and Goofy are sure to capture the interest of many, but is this a game that anyone can pick up and play? The answer is a resounding yes. 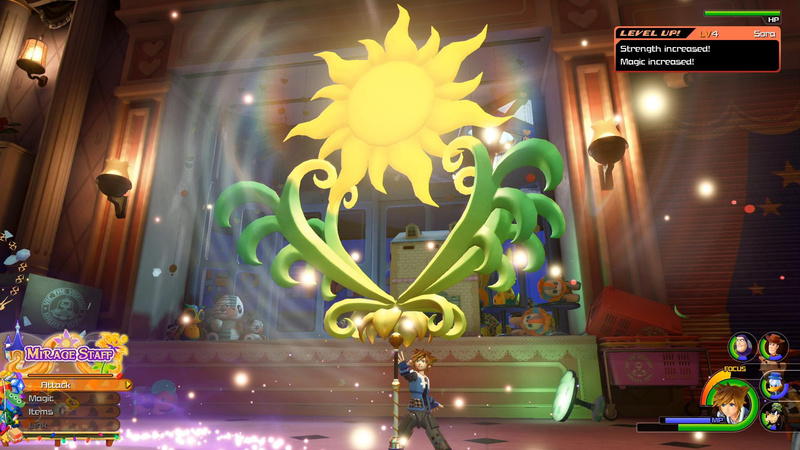 Kingdom Hearts III is a truly magical and special experience you won’t want to miss out on. Is there anything left that can be said about the plot of Kingdom Hearts? As the third mainline entry in a series that actually reaches double figures when all is taken into account, Kingdom Hearts III assumes a lot. 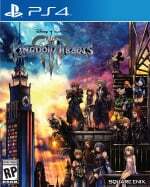 Picking up right where Dream Drop Distance left off, you’ll once again join Sora on his quest to regain his lost powers and rid the world of evil, most notably the evil Master Xehanort and Organisation XIII. That is only the tip of the iceberg, though. 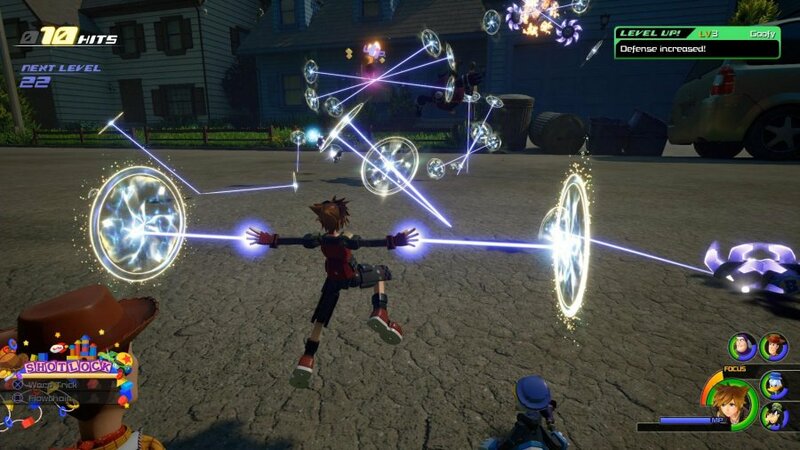 From the word go, it’s clear that Kingdom Hearts III is designed for the fans. Pitched as the concluding chapter for the current state of the franchise, there’s little in the way of introductions, explanations, or detailed recaps for the uninitiated. This of course suits those who have been invested in Sora’s journey for the past two decades perfectly. The game gets right into the action as it tries to neatly tie up numerous narrative threads through meticulously detailed cutscenes and gameplay, and honestly, it absolutely succeeds. Relegated to the touchline for much of the experience, the Square Enix side of things takes centre stage for the latter quarter of the title as revelations and unbelievable battles change the course of the series. There are some absolutely incredible moments to witness during the final few hours of the game, alongside closure for fan-favourite characters such as Aqua, Naminé, and Roxas that takes their arcs in unexpected directions. Those who have been there since the beginning are sure to be satisfied by the time the credits roll, but newcomers will be in for a much tougher time despite the somewhat obvious stakes and payoff at hand. It's absolutely possible for someone with no prior knowledge of the series to jump into Kingdom Hearts III and have a delightful time, but if one wants to understand what is actually taking place, a decent amount of background research is quite simply essential. The game does come with a Memory Archive that sums up the plot in 20 minutes, but even after taking all of that in, there’s still plot points that beginners will be none the wiser to. Because of this, the aforementioned final quarter of the experience is going to be very, very confusing – to the point where many will likely lose interest. If you’re not invested in the plot by the time the concluding hours roll around, it’s probably best to turn your brain off and just enjoy the ride. What newcomers can latch onto, though, is the self-contained stories found within the eight Disney worlds that Sora, Donald Duck, and Goofy visit prior to the final showdown. While some more or less retell the story of the film those worlds are based on, such as Frozen and Tangled’s worlds of Arendelle and the Kingdom of Corona, others opt to mix things up with a spin on what we’ve come to expect from those big cinema screen outings. Take Monstropolis for example, a world famed for its harvesting of the screams and cries of children in Monsters, Inc., continues the lineage that Sully and Mike put in place of using laughter to power the city instead. Elsewhere, Toy Box introduces an entirely new location to the Toy Story universe as Sora, Woody, and Buzz Lightyear embark on a rescue attempt after the Heartless kidnap Hamm and Wrex. 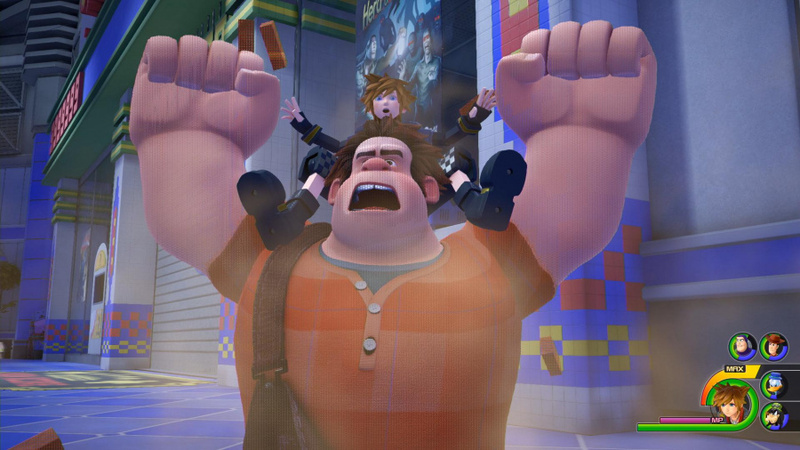 The narratives found within are easy to follow and offer up just as many spectacular moments as the final few hours do for diehard fans, especially so when Kingdom Hearts III gets to expand on those universes we already hold near and dear. That’s not to say that the worlds that stick to the tried and true plots of the films they’re based on are forgettable, though. In actual fact, Tangled’s Kingdom of Corona was by far our favourite world of the lot, with lush forests and Rapunzel’s tower to do battle in, alongside a whole town to explore upon the world’s completion. Arendelle doesn’t drop the ball either with a full rendition of everyone’s favourite song, Let It Go, as well as the return of the hearty bunch of Anna, Kristoff, Olaf, and Sven. Every one of the eight worlds has something new to offer, and there isn’t a single dud amongst them. Alongside its plot, one more aspect that defines the franchise is its combat. It’s what you’ll be engaging with most within gameplay, and so it’s a good job there’s a lot more to it than simply mashing the X button. This is an issue previous entries have faced, but thanks to the addition of a variety of new mechanics, hitting a single button is no longer a route to success. Alongside casting magic, Sora can now call upon a new ability known as Attractions. 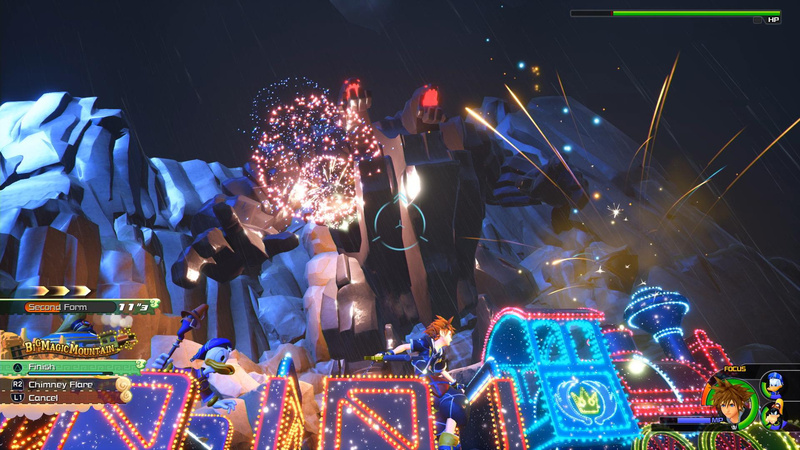 As their name would suggest, these take the form of magical theme park rides that can be activated after eliminating specific members of the Heartless, and to say they’re a visual spectacle would be an understatement. Once they’re on the field of play, you’ll take control of movement and means of attack for more than enough time to destroy whole groups of enemies, making them a lovely addition to the loop of engagements. There’s much more to combat than simply attacking, though. Blocking and dodging allows you to delve into retaliations that deal more damage than the average blow, upgrading Keyblades increases stats across the board, while balancing your AP meter lets you equip new abilities as and when you level up, providing even further ways of dispatching adversaries. Throw accessories into the mix that boost certain statistics and you’ve got the means to min-max your build once you reach the later stages of the title. Outside of combat, there’s a plethora of activities and mechanics to engage with. Explore each and every world in search of treasures, hunt down materials for Keyblade upgrades, or take out the Gummiphone and take some pictures of the numerous Lucky Emblems dotted about the place to move one step closer to unlocking the secret ending. There are even entire mechanics tied to specific worlds. The Caribbean allows you to upgrade your ship via the collection of crabs, mini-games can be found in Toy Box and the Kingdom of Corona that put your dancing and shooting skills to the test, while Big Hero 6 has an entire open-world city to rummage through once you’ve completed its associated story. 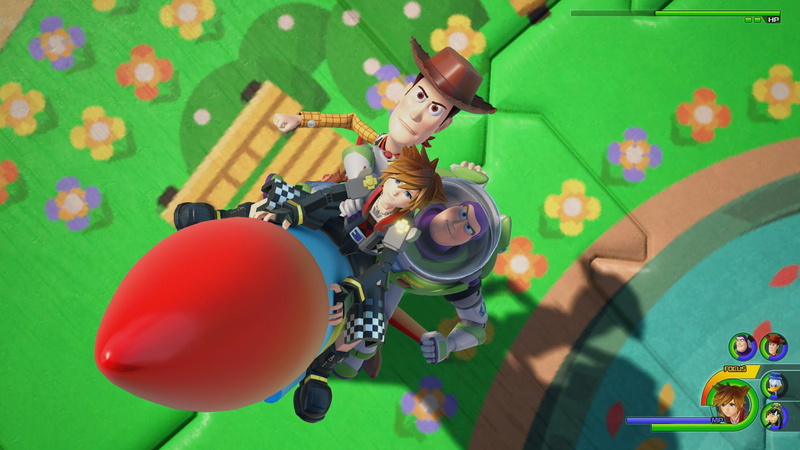 Kingdom Hearts III makes sure there’s something for everyone when you’re not battling the Heartless, to the point where it’s easy to leave the central plot behind for several hours. This is of course going to extend your play time depending on how many hours you’re willing to invest in the game’s intricacies. A typical playthrough of the core story will last upwards of 25 hours, but that can be close to doubled if you decide to reach the heights of the Platinum Trophy. If you do decide to take things that far, though, one unfortunate thing you will have to deal with is the Gummi Ship. Used to travel from world to world through space, you’ll have to put up with confusing menus, needlessly complex building interfaces, and frustrating battles that gate progression. It serves its purpose if you’re just looking to get from point A-to-B, but anything beyond that is a complete hassle. It doesn’t even do a good job of tutorialising things should you decide to construct your own ship. One day Square Enix will learn that the series would be far better off if the returning “feature” was stripped altogether, one day. There’s no doubting that Kingdom Hearts III is a real, real looker. Every world takes on its own visual style alongside a unique colour palette that complements the films those environments come from. The Kingdom of Corona truly pops with dense and rich greenery that goes a long way when setting the scene of Rapunzel’s tower. It’s a dazzling sight as sunlight beats down onto the river that breaks up the blades of grass, while every drop of water shines under the sun. On the complete opposite end of the thermometer, Frozen’s Arendelle impresses with visual delights that look like they’re lifted straight out of the film. It manages to look that good. The fact that Kingdom Hearts III even managed to release could be considered a miracle in of itself, but what’s perhaps even more surprising is that the finished product defies all expectations. As an unforgettable experience, Kingdom Hearts III is exceptional, essential, and most of all, undeniably special. I'm really enjoying it, it's so bright, cheery & alot of fun to play.....until the baddies show up and start babbling their nonsense. Its just such a buzzkill, most of the characters in the game tell them to bugger off, no one knows or cares what you're going on about. 2 things need to be patched in: the ability to save after completing a world, & grown up haircuts for the non disney characters. Other than that, loving it!! I actually had it pre-ordered played it Tuesday and Wednesday last week decided to go back and finish yakuza kiwami 2. Yakuza 2 worked its magic so I will have to go back sometime this week to play through kingdom hearts 3. Its a fun game but because I never played the last few games I am just wading through the story they do have videos to watch but I still think it would be best to have enjoyed the games themselves. So I think the constant referencing to games I have not played is kind of pulling me out not the games fault its just not many series require you to play so many other games previously to get a true feel of the series. 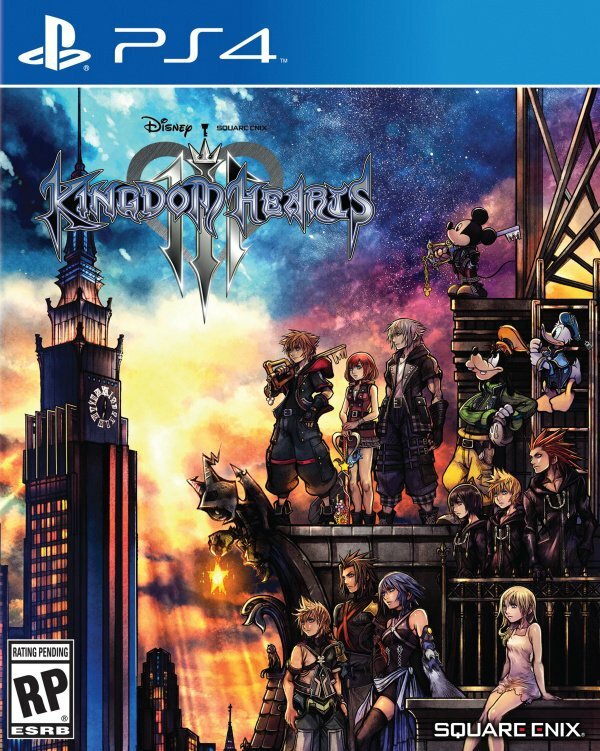 It definitely has the feel of the original KH but I think while I can still go back and get into the original even thought it is dated. This is simply because the story did not feel as convoluted just by playing the fist few hours of kh 3 I can see how bloodly out there the whole story is like Jesus Christ. I waited about 12 years for a Dragon quest game to hit a console in the western market but I was still pumped for it and I think the key difference between this and KH 3 is next to 0 knowledge of previous DQ is needed to enjoy it and the story is more simple this is a game even with the story videos I do not think new players should pick up if you are interested in KH get the 1.5 +2.5 collection on one disc and then get 2.8 finally jump onto kh 3. Great review. I’m in the beginning of the second world and the game is really cool, I was also impressed with the first world, not just an arena this time. Best game I've played since Persona 5. This game was everything I wanted. Nothing about how it has little to no replayability outside of collecting items and Ultima weapon? I didn't expect endgame content like 2 but still a major disappointment. I'm glad you loved it! In an era of live services, KH3 being a lengthy adventure with characters you actually care about feels like such a treat. That rhyme at the end made me chuckle. Nice review! I'm still pretty early, but I am having a blast with it. I am really impressed with the variety of gameplay mechanics regularly introduced. I want to get this but it’s been so long since I’ve played the first 2, and KH 3D is the only other game I’ve played. So maybe I should get the collections first and play through those. Managed to get it a day before release a week ago, and it's the only game I've been playing since. Been a fan of the series since the beginning, and while it's not perfect, it's been amazing to play through and is easily one of my favorite games this gen. I'm really close to finishing it now, and I can say I'm definitely pleased with how it turned out. The combat is definitely the best the series has ever seen, no doubt about that. However, with this game being 10 years in the making, and so many loose ends to tie up because they just couldn't stop making spin offs, the story is next to incoherent for normal people. Like, I get it, but I don't GET it. Finished it this week and ultimately loved it. I get the criticisms for how convoluted it is, but like MGS4, it being unapologetic about what it is and delivering payoffs years in the making is exactly how they did it, and the exact correct way to do it in my book. As a long time fan, KH3 hit all the right notes for me. Loved it from start to finish, and intend to Platinum it eventually. I'm kinda interested in this, but the convoluted story before the events of this game is quite off-putting for a newcomer like me. If I was a bit more interested in this then I might have bit the bullet and got this anyway, but for now I'm going to skip this game. @crimsontadpoles The ‘Memory Archives’ section does a good job in summing up the plot. Perhaps not as detailed as it should be, it’s enough to be an entry point. Long story short...7 warriors of Light, fight 13 warriors of Darkness over the fate of all the worlds. Very nice review. The game is beautiful & everything I wanted it to be (perhaps a little too easy). I’ve spent just as much time in photo mode as I have spent playing the game😅. I still can't get my head around what this game is. One question, is it simple enough for my 8 year old son to play? or even my 5 year old daughter? They would likely get more out of the Disney stuff to be honest. Recommend playing in 1080p on the PS4 Pro, for close to 60fps lock. In "4K", you only get a small 2304x1296 increase in resolution, so it's not worth it, since the framerate takes a major dive in comparison. I am going to have to do a little research on some specific moments from previous games that have come up in cutscenes. Hopefully, I won’t have to research too much throughout the game. I have played previous titles (albeit only completed 1 & 2) and I have good grasp on the overall plot, but I am not clued in to specific character story arcs. Perhaps the Gummiphone will provide me some context to certain characters. If not, I guess I should have a Wiki open. I am weakest in Dream Drop Distance’s story. @tomassi I introduced the first Kingdom Hearts to my Daughter who was seven at the time. She really enjoyed it as did I. I don't know how much they've changed the game controller mechanics since then. All I can say is give it a go. Chances are the kid may well get the hang of it eventually then really enjoy it. The games are great fun. You could start by having them watch while you play and let them engage as much/little as they want. loving it well worth the wait would of liked to have seen more worlds from the first two games and are there ant FF in this one as not seen any yet! @nathanSF I just watched a gameplay video. It looks OK I guess. Do you get to control the Disney characters though, or are they just window dressing essentially? And is there any kind of offline/couch co-op/multiplayer element? Kingdom hearts 2 and kingdom hearts birth by sleep say hi. @tomassi No to all your questions. @KingdomHeartsFan So you can't control the Disney characters at all? This all sounds a bit 'meh' to me then. It's a pass I think. From what i remember, the original way back on the PS2 was charming in its own way but I never finished it because the combat was pants. @tomassi Goofy and Donald are your main companion combatants and I'm sure I read somwhere you can synth into them as well as summon other powerful characters from the films. Bottom line is if your kids are into Disney then the game is worth it. "Team-up attacks are also featured, which combine Sora and various party members into one attack"
@FullbringIchigo I don't have any interest in the game, that's the point! I would POSSIBLY have some interest in the game if (a) my kids did, which they probably won't if they can't actually control the Disney characters and (b) it allowed me to play WITH my kids. As it offers neither, then it's of no interest to me at all. @FullbringIchigo Stick to Disney Infinity I guess! the horrendous writing of the Caribbean level, where you don't understand who are the protagonists, where you are or what's happening most of the time. There's a few weird ellipses that make you change location without you knowing how or why. Clearly a miss. The ending, that you just CAN'T understand without having played to the f2p mobile game. And no, this one is not explained in the archives of the Gummiphone. It's disrespectful to the players. So yeah, the game was a joy to play, there was frenetic action, many great characters and awesome locations (San Fransokyo) but on the storytelling side, it's another big miss, perhaps the biggest of all, when they should have tried harder. @Tatoun As someone who has played (more like suffered) the mobile F2P game, I'd say you wouldn't get much out of it to help you figure out the ending here. The Back Cover movie included in II.8 is a lot more involved with what is talked about in the ending here. Most of the mobile game's story is filler, and while you get some neat snippets of information and some character appearances toward the end of KHIII would be familiar, it's not too substantial at this point. That doesn't mean it isn't important, but in regards to the ending of KHIII? I don't think you're missing out on too much. Just watch Back Cover. Even still, it doesn't make much sense to me. Typical Kingdom Hearts. Lol. Just finished it on X1. Totally worthy of the praise. Had it been an exclusincluded more Disney worlds, it'd have been a total 10. Loved the game, but I do agree with some of what the critics say. Looking forward to Kh4 or whatever they end up naming it.